As well as campaigning on behalf of historic buildings, we are committed to promoting the study of architectural history and conservation. Our Transactions (TAMS) have been published in hard copy, and distributed to members each year since 1953. Libraries with a complete set of the Transactions include: The British Library, the Royal Institute of British Architects Library and the Society of Antiquaries (all in London) and the National Libraries of Scotland and Wales (although the latter is missing volumes 1953-5, 1974 & 1993). Each year the Transactions is also deposited at the usual copyright libraries (see http://www.llgc.org.uk/cla/). Please use the Control + F keys to search for a specific word or term on this page. For example to search only for reprints of individual articles simply search for the word ‘reprint’, or for a particular author search by their surname. If you are undertaking several searches, you may need to ‘release’ the current search by de-selecting any text picked up in your previous search (click in a blank space on the page), otherwise the new search may record a nil result. 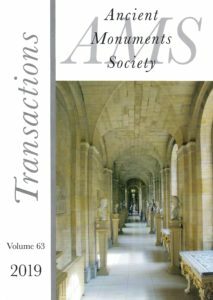 This volume also includes an index to Transactions 1953-1982. Essays for R.W. Brunskill, former Chairman of the AMS and of the Friends.